My name is Karen Liljenberg. I was born in 1957, in Bootle, Merseyside. I attended local state schools, where I first developed my lifelong interest in ancient cultures, languages, and spiritual traditions. I went on to study Classics and Archaeology at Girton College, Cambridge, graduating in 1979. Having taught myself Welsh, I then moved to Wales where I learnt to play traditional music on various instruments while working in the fields of archaeology, lexicography, and language teaching. I also had some of my own poetry published, with a collection appearing in 1992 ("Bóand's Hostel", Sheela-na-gig Press). In 1992 I became interested in Tibetan Buddhism, and began learning Tibetan. Attracted in particular to the Dzogchen teachings, I joined Rigpa and attended numerous retreats and teachings in the UK, Ireland and France. I went on a group pilgrimage to India and Sikkim in 1994. 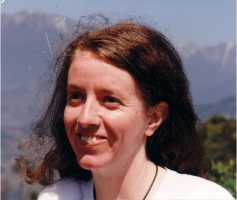 I then returned to India as a volunteer English teacher at Dzogchen Monastery, near Kollegal. I paid the monks a second visit the following year, spending about nine months there in total, gradually improving my Tibetan in the process. Having obtained a CELTA certificate in London in 1996, I moved to Brussels where I worked as an English teacher. I also began doing Tibetan-English translation and interpreting work for various lamas. After moving back to the UK I obtained an MA in Buddhist Studies in 2008, and in March 2013 I completed my AHRC-funded doctoral research and was awarded my PhD at SOAS, University of London. I am now writing up my research on a group of early Dzogchen texts with a view (hopefully) to publication. I am also translating sutras from the Tibetan canon for the 84000 Project. If you have appreciated the translations on Zangthal and would like to make a donation, click the button below to donate using Paypal or credit/debit card. Thank you for your support.